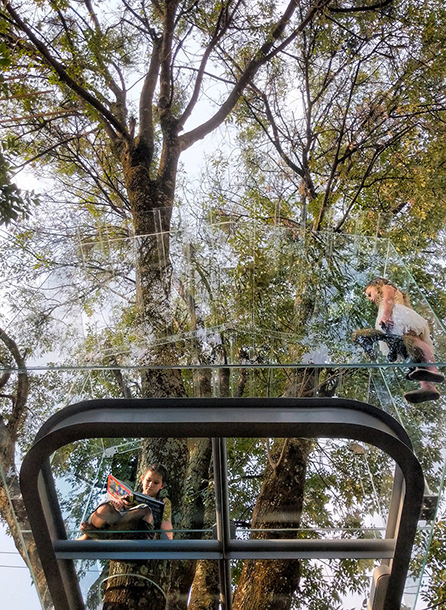 Gerardo Broissin's amazing glass cabin seems to hang over the garden of a private home. 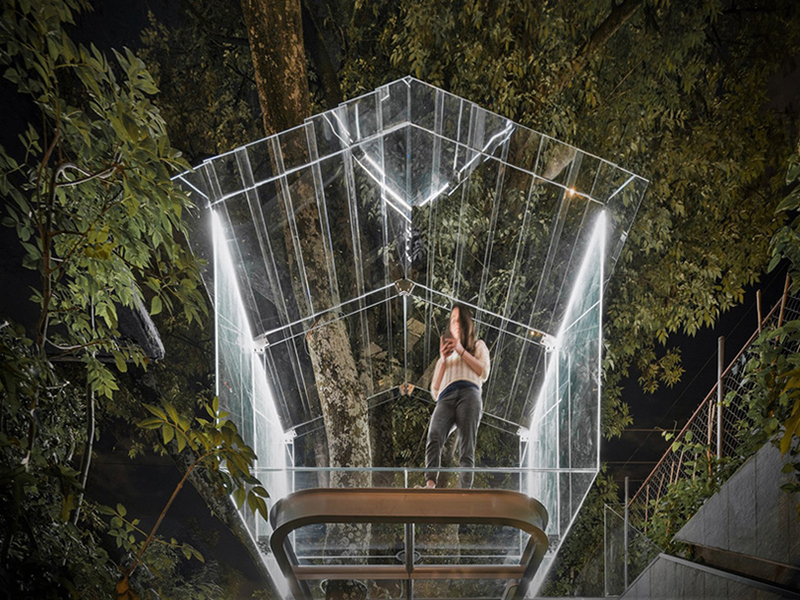 This crystal shelter, also called Chantli Kuaulakoyokan, is "house at the top of the tree", in Nahuatl (a macro-language of the Uto-Aztec family), serves, daytime, out-of-common playground and adopts, at night, an unreal face, illuminated by neon lights. Located at the foot of the Sierra de las Cruces hills to the west of Mexico, the refuge in its narrow garden forms a first contact with its surrounding nature. Rather than using conventional wood to create this cabin, the architect reinterprets his typical morphology to the two-sided roof in an ethereal realization. 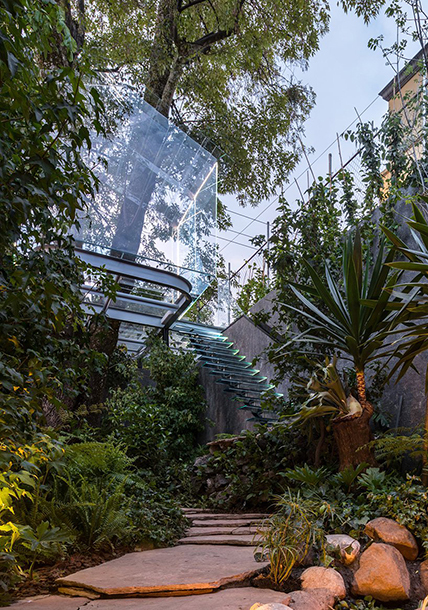 Above the garden-forest designed by him and consisting of a miniature basin surrounded by stone slabs and lush vegetation, the fully glazed construction is accessible by a staircase, also in glass, concealed along the fence in concrete of the property. 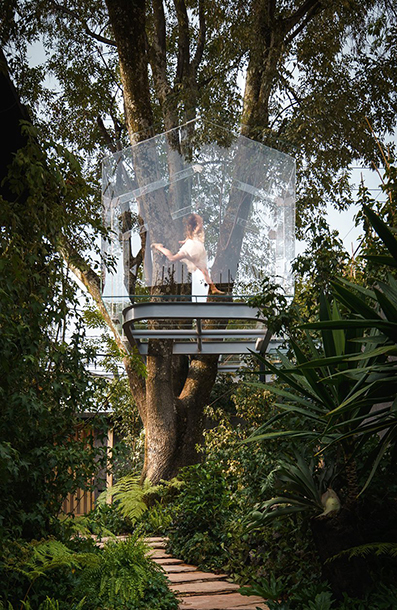 The miniature building is just a few meters above the ground and measures 7 square meters, enough to accommodate simultaneously an adult and three children, who can exploit the space to play while enjoying an unobstructed view on nature. With this realization, the architect refers to the "Privacidad", a play played by the actor Diego Luna in 2018, which questions the intimacy promised by social networks, to which he responds with a creation that overturns the the physical intimacy of the house, and the virtual one, which takes place in daily exchanges. 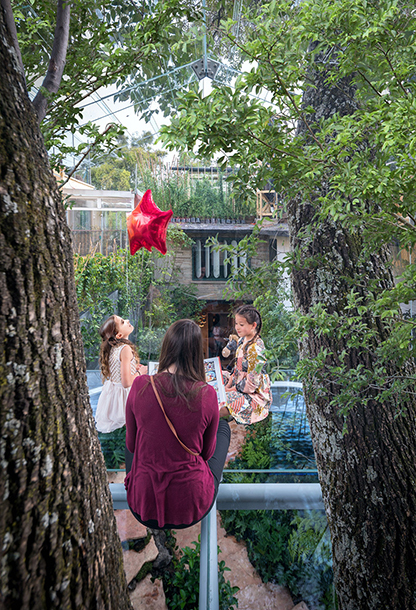 In addition to being the annual refuge of the inhabitants of the house, the crystal hut periodically becomes, on the occasion of the Mexico Design Week, a place of shared experience. To stay suspended, day and night, away from the hassle of everyday life. You are here : Home Magazine Muuuz headings Architecture Gerardo Broissin: Glass Hut "Chantli Kuaulakoyokan"